With rents on the increase and house prices in many areas still below their previous peaks investing in a buy-to-let property is looking more appealing. However, if you are contemplating dipping your toe in the water as a landlord and investing in buy-to-let then you need to read my guide below to understand the risks and costs involved, as well as your potential return. 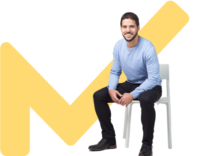 (Note: If you are considering getting into buy-to-let or already are a landlord then I suggest you take advantage of this FREE buy-to-let mortgage consultation). Well,buy-to let certainly can be, but there are some issues you need to be aware of with this type of investment. If there is one thing we have learnt in the last couple of years it's that property prices can go down as well as up. Whilst over the long term property prices have risen, you need to realise that buy-to-let is no 'get rich quick' scheme. 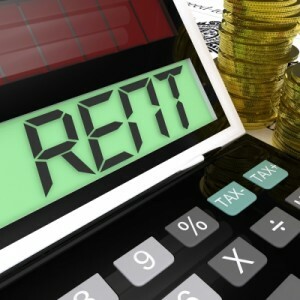 At the present time rental yields are high due, partly, to the inability of many first-time buyers to obtain a loan to purchase a property of their own. A sizeable deposit is now required by lenders to secure a mortgage, which is beyond the reach of many would-be-purchasers. This will not always be the case and a time will come when tenants will be thin on the ground resulting in falling buy-to-let rents. 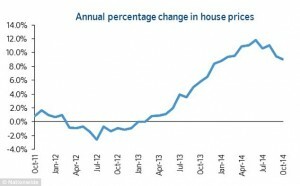 The graph below shows the percentage growth in property prices over a three year period. As you can see house prices can go down as well as up and sometimes spend years going sideways. The return on your buy-to-let investment is called the rental yield and is dependent on a number of factors - type of property, location, market conditions and condition of the property. The gross yield of a buy-to-let property is the annual rent divided by the purchase price, expressed as a percentage. The graph below shows the total annual return (rental income and price growth) adjusted for void periods for 2010 to 2014. The net yield is the annual rental income on your buy-to-let property, less costs such as mortgage payments, repair costs, fees and void periods divided by the purchase price, expressed as percentage. Gross rentals yields in the UK are running at around 5% (2014) but the net yield can be a lot less if your costs are high or you experience long void periods. Cheaper buy-to-let properties will provide a better annual yield and I recommend that you look for a rental yield in the region of 130-150% of your mortgage payments. But as I've mentioned, the location of your buy-to-let property will influence your return, so read my article 'Where to invest in a buy-to-let property to get the best return'. Will you need a mortgage to purchase your buy-to-let property? If you are not fortunate enough to be able to finance the full buy-to-let purchase price with your savings then you will need to secure a buy-to-let mortgage, or a remortgage on your current property. You will require a minimum deposit of 25% of the buy-to-let purchase price to secure a buy-to-let mortgage. Remember the higher the deposit you can put down on your buy-to-let purchase then the better by-to-let mortgage deal you can secure. (I suggest you take advantage of a this FREE buy-to-let mortgage consultation to find out how much a lender will lend to you and to secure the best deal). Substantial resources are required to purchase a buy-to-let investment property. Firstly if requiring a mortgage a lender will likely require you to fund a deposit of 25% or more before they will consider your loan application (more on this below). In addition there are the usual costs involved in a property purchase - survey fee, stamp duty, legal costs, mortgage admin fee & insurance. Once you have purchased your buy-to-let property there are further costs involved before you earn any return on your investment. You will need to clean the property and carry out any repairs, purchase furniture, appliances and equipment your tenant will expect. In addition you will to pay for a Gas and Safety report to comply with legislation. If you are letting privately then there will be advertising costs, or instead you can pay the fees for a letting agent to find a tenant. There are also fees involved in carrying out an inventory, drawing up a tenancy agreement and obtaining references. Some buy-to-let properties cost more than others to maintain depending on the age, condition and other responsibilities such as lifts in blocks of flats. The single biggest cost is likely to be your mortgage repayments. At present mortgage rates are low, but this won't last forever so you need to make allowances for a significant rises over the coming years. You will also need to insure the property and its content, plus it is wise to consider public liability insurance and rental insurance. If the property is leasehold you will also have to pay an annual ground rent and service charge. If you are planning to become a buy-to-let landlord for the first time then you need to be aware of your legal responsibilities regarding any properties that are let. Here are your main responsibilities detailed under the various categories. All electrical appliances must be checked at regular intervals for defects (e.g. frayed wiring, poorly fitted plugs). Although there is no statutory checking procedure or timescales, it is strongly recommended that an annual check is carried out by a qualified electrical engineer, records of the checks should be kept and available for inspection if required. Any unsafe items must be removed from the property prior to offering it for rent. It is advisable to fit smoke alarms to all properties and include these in the annual check to ensure they are working. All gas appliances and associated pipework and flues should be maintained to ensure they are safe to use. An annual inspection by a qualified Gas Safe gas engineer is now a requirement by law. A gas appliance with an open flue must not be installed in a bedroom. Where a gas meter is installed in a meter box the tenant should be supplied with a suitably labelled key to the box. After work is carried out on any appliance, a specified series of safety checks must be carried out by a qualified Gas Safe gas engineer. Instructions on how to operate all gas appliances must be provided to the tenant. Any gas appliance that is known to be faulty or wrongly installed must not be used and should be repaired or removed immediately. All gas appliances require ventilation to work correctly and safely, so care must be taken to ensure vents and air bricks are not blocked. Failure to comply with the safety regulations above is a criminal offence and could result in a large fine or even imprisonment. All beds, mattresses, headboards, scatter cushions, pillows, stretch or loose covers for furniture, children's furniture, garden furniture must carry the appropriate labels for fire compliance. The regulations do not apply to furniture manufactured prior to 1950, bedclothes, loose covers for mattresses, curtains, carpets, sleeping bags and cushion covers. Any tenant's deposits must be paid into a Government approved tenancy deposit scheme within 30 days of receipt. Failure to comply could result in a financial penalty of up to three times the amount of the deposit. A HMO is any house or flat that is occupied by two or more households, is used as their main or only residence and where basic facilities such as kitchen, bathroom or toilet are shared. A household could be a single person, members of the same family living together or partners living together. Do HMOs need a licence? HMO must be licensed if they have three or more stories or are occupied by five or more persons forming two or more households. Local councils have the power to extend these rules to other properties. What are the requirements to obtain a licence? The local council must also set conditions in relation to the facilities in the property to ensure the safety of furniture and gas and electrical installations. Are there any penalties for a landlord not applying for a licence? Are there any penalties for a landlord for breaching the terms and conditions of a licence? It's a criminal offence for a landlord to have more occupants than the licence allows and they can be fined up to £20,000. If the conditions of the licence are breached then the landlord can be fined up to £5,000. What are the top tips to being a successful landlord? If you are contemplating investing in a buy-to-let property there are some key areas you need to address to guarantee a successful outcome to your investment. If you are considering investing in your first buy-to-let property then you will need to decide your investment goals and the strategy you are going to adopt. A business plan needs to be created, well ahead of your initial investment, covering the following areas. How much money are you going to invest in your buy-to-let and will you purchase the property with cash or will you require a mortgage? What is the purpose of the buy-to-let investment, do you want to create a monthly income, capital appreciation, or both? How many properties do you want in your buy-to-let portfolio, are you looking to build a portfolio of properties or just stick with one? What type of buy-to-let property are you going to choose for your investment (houses, apartments, student lets or even commercial properties) ? What is your exit strategy when you eventually need to realise your buy-to-let investment. When and how is this going to happen? Do you want a buy-to-let property ready to let or are you prepared to do some work in bringing a property up to rental standard? Do you want to invest in a buy-to-let property close to your home or are you prepared to look elsewhere for the best potential yield? Will you allow children, pets and smokers in your property? Will you allow those on benefits to rent your property? Will you let to students? Who will vet the tenants, you or a letting agent? Will you manage the buy-to-let property yourself or are you going to use the services of a letting agent? Read my article 'Being a landlord: Using a letting agent vs doing it yourself' for more information. If you are managing the buy-to-let property yourself do you have a maintenance person or company who can deal with any emergency call outs? Then source the best deal yourself or employ the services and knowledge of a professional mortgage adviser to ensure you get the best buy-to-let mortgage deal. Great guide and very thorough. I’ve never seen the graph of gross yields before. Is that average across the UK?